Fully insured, safety minded and highly trained crews. ISA and ANSI standards followed on every tree. 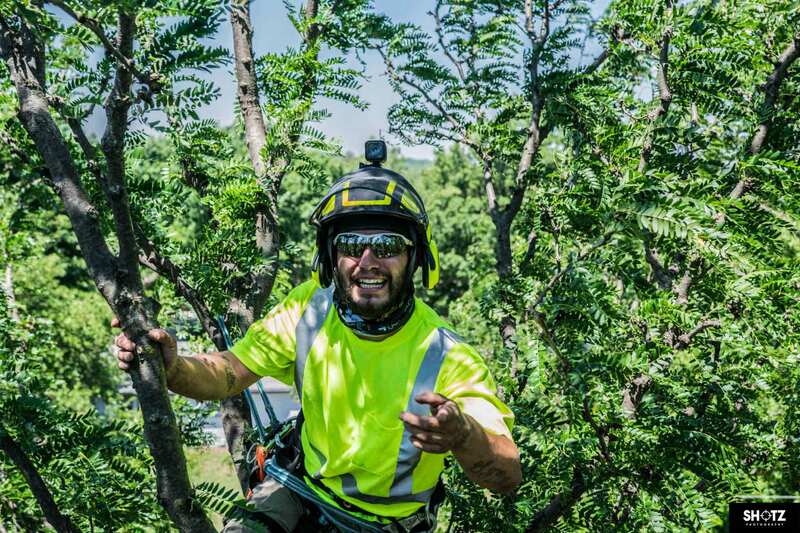 At Wichita Tree Service you can expect a different kind of tree pruning experience. Wichita Tree Service employees only prune trees to ISA and ANSI A300 standards. The types of pruning we offer include clean, raise, reduce, thin. We will never violate the arborist code of ethics, we will not top, lion tail or spike any living trees. Unless in an emergency or absolute necessity. We educate customers on proper pruning techniques in order to prevent damage to trees. Why don’t we top trees? A proper crown reduction can reduce the height And weight of a tree without causing as much irreversible damage to trees. Cutting back to a lateral limb allows the pruning cut to heal better and the tree to have a dominant limb to continue growth. Why don’t we wear spikes when we climb trees we are pruning? Because it’s really bad for trees. We only hire advanced climbing arborists that don’t need spikes. Tree Removal and Land Clearing. Wichita Tree Service has the experience, equipment, and tools necessary to tackle any tree removal or land clearing job with ease. We offer tree removal services for both commercial and residential clients. Wichita Tree Serice has done jobs for the City of Wichita, Mulvane, homeowners associations, The Sedgwick County Zoo, Cessna Aviation, Wichita State University, and many other large commercial clients. We have worked with customers like Conco and Dondlinger construction on land clearing jobs. We often beat large excavation companies on land clearing by thousands of dollars because of our specialized equipment, efficiency, low overhead and ability to recycle waste. These 4 factors Help us keep our cost to the customer lower than excavation companies and large national tree services. Large land clearing jobs are no problem for the crews at Wichita Tree Service. On projects like the Slate Creek Wind Farm near Wellington, we cleared miles limbs overhanging the roads for less than the competing excavation company who was going to rip the limbs down with an excavator, leaving large open wounds on the trees. this would leave the trees open to infestation and disease, we were able to do the job making proper cuts for a lower price. 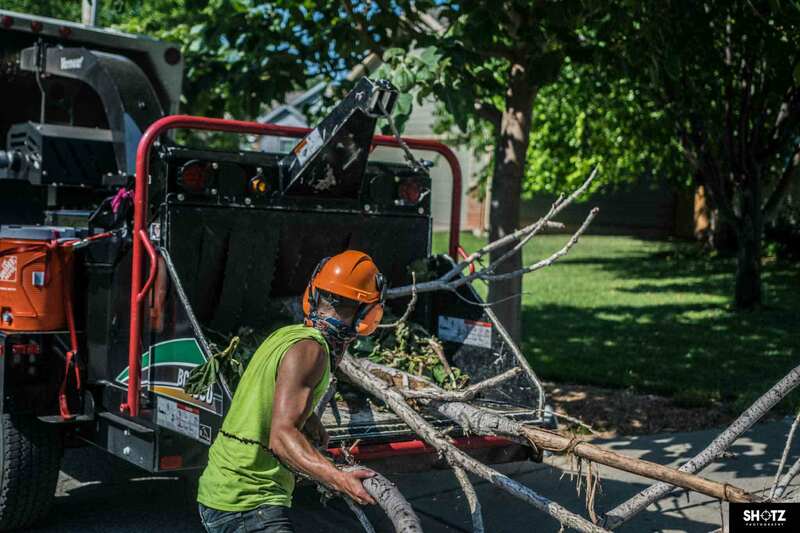 Whatever the project Wichita Tree Service has what it takes to get the job done. Have a stump left behind by another tree service? Have a stump that other companies cant get to? Wichita Tree Service has the answer. We have one smaller 13hp machine that can be carried through a building if needed and Our larger Vermeer Sc362 can take on any larger stumps you might have. Our equipment is high powered to get the job done fast but also easy to transport and can fit in a 36in gate if need. We grind all stumps 12 inches below grade to prevent regrowth of stump. We also offer mulch removal for an extra charge and we can bring in topsoil to fill the hole so it will look like a stump was never there. we can grind most stumps for less than the cost of renting a stump grinder and doing it yourself! Give us a call for a quote today! Our certified arborist can help identify, treat and prevent Tree healthcare issues. Do your part, plant a tree! Trees Produce the oxygen we breathe! Lightning protection is a unique service we offer protecting trees from lightning, we install a copper cable in the tree to divert the flow of electricity away from the tree and into the ground. How Much Does Tree Service in Wichita Kansas cost? I have read many sites trying to explain the cost of tree service, tree removal or tree trimming. All of the websites available are obviously written by A web developer or journalist who doesn’t know anything about what actually goes into pruning or removing a tree. With this article, I will try to help explain the cost of tree trimming, tree removal, land clearing and stump grinding. 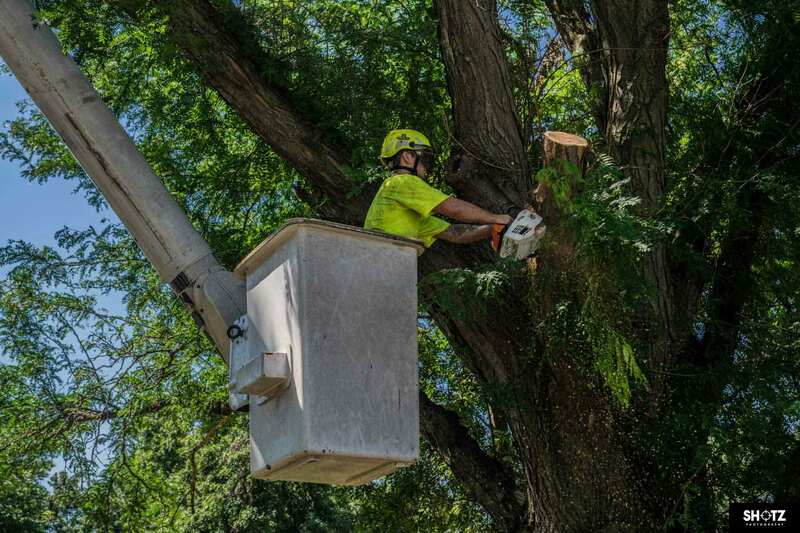 Prices will vary from state to state although, these prices can help you understand what to expect when hiring a tree service in Wichita Kansas or the surrounding area. Let’s start with stump grinding, the easiest to explain because the price is normally about the same for all stumps. Wichita Tree Service charges a flat rate of $4.5 per inch for stump grinding so if you have a stump with a diameter of 20inches the price will be $90. We have a minimum charge of $75 for smaller stumps this covers the cost of drive time. I know of some companies in town with a $350 minimum. 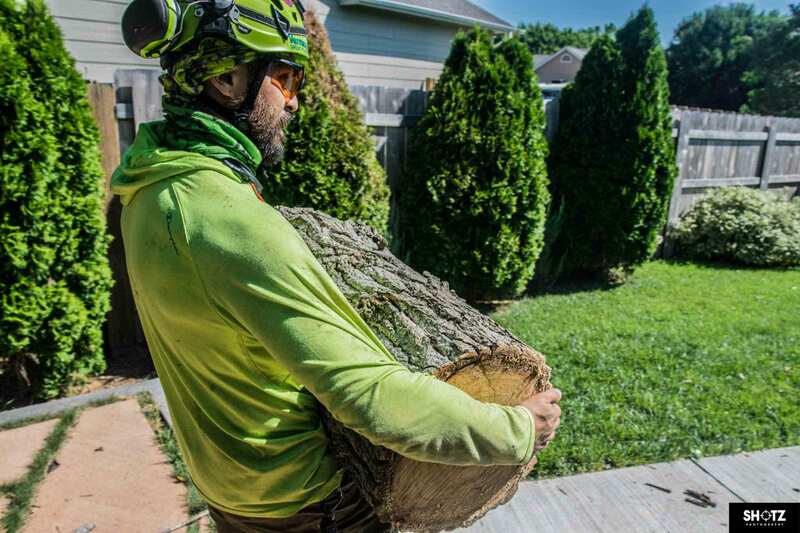 For your average stump, you will be looking at $75-$200 when using Wichita Tree Service. This price will be lower if we also remove your tree. The price might be higher if your stump is in an extremely hard to reach area like at the bottom of a hole or on top of a building but our large stump grinder can reach 99% of all the stumps we do because it can fit in a 36-inch gate. When estimating tree removal cost we will have to come out and see the tree, we will need to look at the whole area, so no, pictures will not help. When I go out to look at a tree removal the first thing I look for is what we call drop zone. How large is the area under the tree, is there a house or shed in the way, is there wires running through the tree, is there a fence in the way. If there is little or no drop zone limbs will have to be rigged down with ropes increasing the difficulty, time and risk involved in removing the tree. The cheapest trees would be small trees with a large drop zone and easy access for trucks. If the drop zone is large enough that we can fell the tree to an open area. you will be looking at the lower end of the tree removal price spectrum, $100-$1000. Next, I see if we have access, can we get the bucket truck anywhere near the tree, we have a 60ft bucket truck that can turn a whole day tree removal into a few hours. Trees with little drop zone but are able to be removed by bucket truck can still be on the lower end of price. If there is little or no drop zone or bucket truck access we will remove the tree with a climbing arborist and possibly even a crane, these are the trees that are going to cost more if they are large. If you have a large tree with little drop zone and no bucket truck access. The price and time we spend on the job will increase. Large trees with no access or drop zone could cost $1500-$3500. The most expensive tree we have ever removed was also the largest tree we have ever removed and in a very tight spot overhanging houses, wires, and other structures with no drop zone or bucket truck access. “First, we called another company recommended by a top nursery in town. They took our call, said they would be out and did not show up. We called again, they said they would be out again, and we never saw them. We called Wichita Tree Service, they said they would be out and they showed up. “A recent storm caused a lot of damage to our 45 year old Black Walnut Tree. There were so many limbs down that we were afraid that we might lose the whole tree. We called several places for estimates and advice, but Wichita Tree Service responded to our request right away. When the owner came out to our house, he was professional and knowledgeable; he obviously really cared about the trees. He answered all of our questions, offered some thoughtful suggestions, gave us some choices, and then came up with a very reasonable bid. We were so impressed that we knew that we wanted this company working with us. The team came out very quickly and they were all very courteous, skilled, and experienced. We enjoyed watching the team and their equipment. They were so efficient. The yard was very clean and neat when the team finished. Best of all, our tree looked amazingly nice and was on its way to a healthy recovery. All of the trees on our property were planted as saplings over 40 years ago. We will trust Wichita Tree Service to care for their needs in the future. I strongly recommend this company to any homeowner who in need of care for their trees and landscaping. WORK WAS DONE TIMELY WITH NO DAMAGE TO ANYTHING AROUND TREES. THANKS FOR A JOB WELL DONE. My name is Robert Phillips, I am the owner of Wichita Tree Service LLC. I started this business in 2012-2013 when I was a broke college student here in Wichita. I was going to school for business at WSU and Butler When I created this website offering tree removal, stump grinding, tree pruning and tree trimming services to the Wichita Kansas area. Soon after the Website took off and before I knew it Wichita Tree Service was born, basically overnight. I hired some friends, bought a small stump grinder from a home depot rental department and went to work cutting trees. The only equipment I had at the time was my beat up f-150 that I bought from a salvage auction for around $1000 and boat trailer I bought at a garage sale. When I started out I knew there was a lot of competition in town and I would have to do something to stand out. I did this by doing things differently. I decided from the beginning that I was going to do things the right way, no cutting corners, no spiking trees, no topping trees, no lion tailing trees, Following ANSI Standards, Following ISA Standards, having all required insurance, wearing proper protective equipment, practicing proper tree pruning and just being more professional than the competition. I modeled my business after larger tree services that do things the right way because I believe that is the key to their success. I educated customers about the adverse effects of topping, spiking and lion tailing trees and only did proper pruning practices. Today I can proudly say my plan worked, we grew 100% year after year, I hired more employees and bought new equipment. Today we are close to being the biggest local tree service in town, we are still growing and we are now expanding into tree health care, tree planting, land clearing and other aspects of arboriculture. With the help of the Wichita community, we added a second tree crew this last year and plan on adding a 3rd crew in spring, that would make us the biggest local tree service in Wichita!